Meet Timothy a new cheerful little oil burning steam engine who works at the Clay Pits and loves being useful! 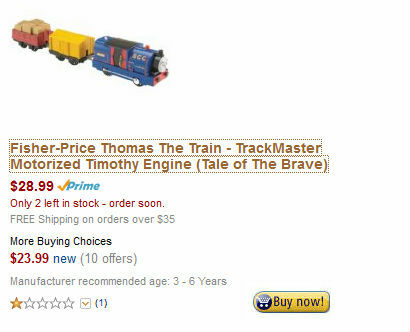 Timothy is featured in the New movie Tale of the Brave DVD with Trackmaster Gator and Trackmaster Scared James. Timothy is dark blue engine who works at the Sodor China Clay Company with Bill and Ben. With enhanced speed and performance, TrackMaster engines go faster and climb steeper inclines, driving Thomas & Friends to greater speeds, taller heights and bigger adventures! Flip the switch and watch Timothy race along on another exciting journey. He's the perfect addition to your collectable, expandable, motorized TrackMaster world! 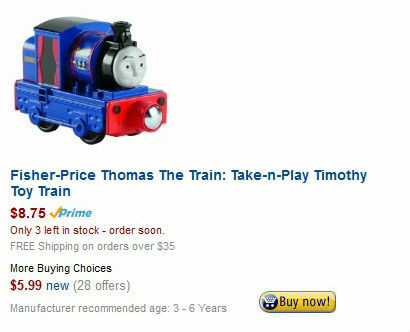 Features: Motorized TrackMaster Timothy engine includes two cargo cars. Redesigned TrackMaster engines feature enhanced speed and performance. The perfect addition to your expandable, connectable, motorized Thomas & Friends TrackMaster world. Motorized train play is compatible with most TrackMaster track and play sets (sold separately). Requires 2 AAA batteries. Ages 3+.